Our flights to Siem Reap cleared just a few days before our departure. And our first choice of hotel for this splurgey post-Christmas/Wedding Anniversary trip would have definitely been the Amansara. When the Amanresorts group of hotels opened in 1989, it broke a lot of barriers with respect to small luxury watering holes. 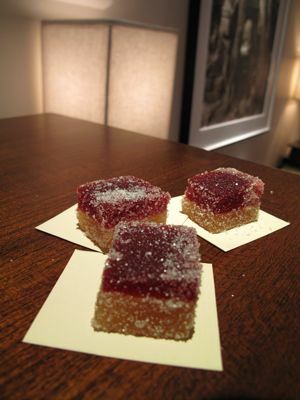 We soon became certified “amanjunkies” and spent more than a dozen wonderful holidays at various Aman properties. We spent our honeymoon at Amandari and Amankila, anniversaries, birthdays or holidays at Amanpulo, Amangani, and other Aman properties, and The Kid even managed a trip to several Amans before the age of 5. Amanresorts is celebrating it’s 20th anniversary this year and I feel so strongly about them that if I had to be a hotel, I would definitely be an Aman. Then “real life” set in and a long draught of more modestly budgeted holidays were the norm. But we still aspire to an occasional Aman fix, and top on our list right now are the Aman(s) in Bhutan and Morocco. 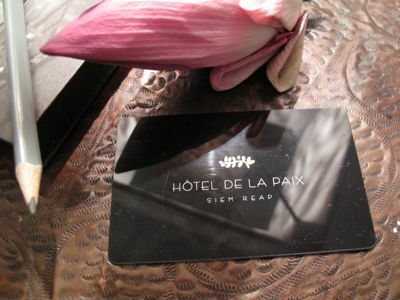 So more on Amansara (their property in Siem Reap) later, as we ended up staying at the Hotel de la Paix instead. We were given a rather large room, as they were aware we had a teenager with us, so it was very comfortable indeed. 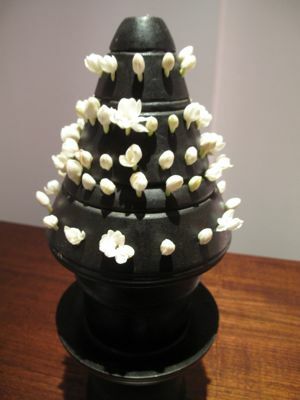 Nice little touches like fresh jasmine flowers in black wooden holders provided a pleasant natural aroma to the room. The beds were wonderful, laid on a wooden base (normally a downer as springs are more comfortable), they were lined with a feathered pad beneath the sheets and a soft comforter on top. Definitely something to come home to and plop down on after a long day wandering through ancient temples. Everything was dark brown, black and white with fabrics in white or tan. The Teen thought it was wonderful. And the daybed was converted into a very comfortable sleeping nook for the Teen, which meant we didn’t have to get two rooms… Artwork included beautiful large photographs of temples from around the area. And the bathroom! Egads, open large bath (presumably designed for two fit newlyweds, not middle-aged pot-bellied manongs and manangs), enclosed rainshowers, toilets etc… It looked stunning, but wasn’t the most private of arrangements…heehee. This definitely looks better in brochures than practicality warrants. I am not a fan of bathtubs, so this could have been storage for maletas instead, or a nice cozy bed for the Teen, but different strokes for different folks, I guess. :) Little touches like rolled towels in vertical nooks in the shower area, lotus flowers all over the place, wood and stone finishes, a wonderful luggage rack that was so simple and so functional and big closets with lots of hangers all made this quite the home base for a few days. I’m sure it helped make a great impression on the Teen when she realized at the head of her bed was an ipod, ipod dock, speakers and various other doodads to ensure her listening pleasure. We were also showered with cassava snacks, fresh fruit and lots of water. And before bedtime every night, we got pates des fruits, chocolates or other sweets to ensure a calorific end to each day. Please visit their website for more views of the hotel, particularly the public spaces. They have an interesting pool, a terrific spa and a pretty cool lobby and garden area. Wow, this is an awesome hotel. Shy of the hotel I stayed in Paranaque, napilitan lang ako kasi that is where my sister was booked and she was “staging” a family get together. Anyway, I brought my “ministry” group with me, who have not been in any hotel. Ayy naku, 2 ladies did not want to leave. Magpapa-alila na lang daw sila duon. Sabi ko naman, maganda kung ikaw ang occupant, siempre you are pampered, pero ewan kung ikaw ang server. Basta ako, when I get into a hotel, first priority ko bathroom.. very picky ako sa line na yan. Beautiful! But the open bathtub made me recoil, hahaha! I was thinking that the other two of you had to leave the room while one was bathing. =) Their considerations for the teen were really something. Thanks for sharing your travel experiences with us MarketMan. Your travel entries are always interesting, educational, amusing, inspiring and are always a welcome distraction. Reading this post is much more fun and relaxing than checking my Crackberry. The Teen is very fortunate to be such a world traveler at a young age. Traveling to different countries and exposure to different cultures is something one cannot learn or appreciate as much in a classroom. I like the attention to detail of aman property hotels. They always have that special touch. Travelling is one of the most educational experiences in life. It gives you a glimpse into all the aspects of other people yonder…sigh…wonderful!! 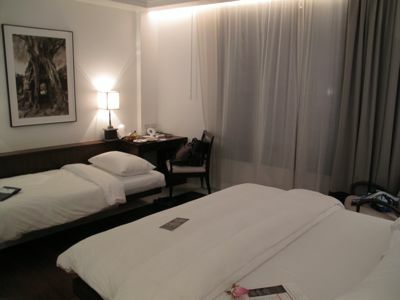 Nice hotel! Even the hallway looks great. There was just one thing that made me cringe and it wasn’t the open bath- the cling wrap covering the cassava cakes! Haha. OUT OF TOPIC MM: Wow! Just finished my fresh milk-cream-bain marie (oven) version of your leche flan–and HANDS DOWN OR HANDS UP!!! The best!! Silky,not so sweet…wonderful,truly wonderful. Hubby said “super sarap!!”. He asked me to remove the plate with leche flan as he was sure he would finish the whole thing…thanks so much MM for your posts on this!! This has helped me reach my dream leche flan!! Now,am convinced Leche Flan ala MM is the best! !Daghan Salamat!! Meantime,bettyq,am waiting for this fudgy brownie to cool down. House smells so good with this browny in the oven..also,the FFtg will be done in 5 minutes…..egads..went berserk baking today!! Must be from all the frustration with that putong ube…teehee…Happy Sunday!! chrisb… good catch… details, details. 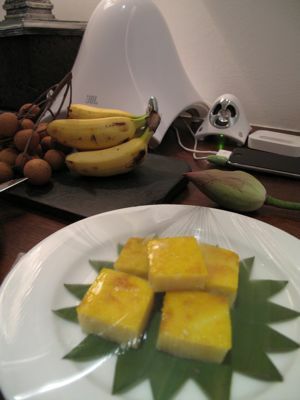 Actually the cassava cakes were waiting for us in the room, and since arrival time was iffy, then the cling wrap was probably a reasonable glitch from a hygienic perspective. Haha, yeah I figured. I just have a thing for cling wrap I guess. I use cling wrap a lot in the kitchen and sending out anything still wrapped in it would be unthinkable. =) Like furniture wrapped in plastic or wearing clothes with tags still on. chrisb, I’m curious…what do you use then? Also, I learned that cling wrap is not good for microwaving like it emits carcinogenic substance. But how about microwaving with a plastic cover so as to avoid splatter in the microwave? I think the cassava cake is pretty that I didn’t really mind the cling wrap. 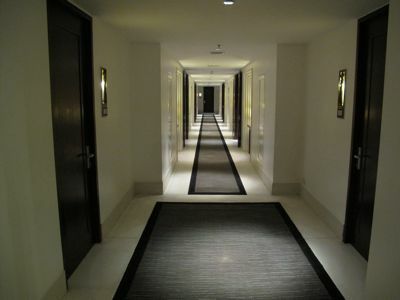 MM, I checked the rates…quite expensive for me but look at this hotel’s hallway…it’s wide! OUT OF TOPIC AGAIN: bettyq,Your fudgy brownies are really super sarap!! This is the brownie I like and am looking for and am so happy with it.I was worrying why I was using only 1/3 cup AP flour but yehey!! It was fudgy…really,really good and it is in the color that a brownie should be!! Salamat again!! Grabe,your recipes fit me to a T.(grr..except that elusive putong ube hahaha).I also make my own tocino and don’t buy them anymore..just made some…Salamat. MM,I also made your version of FFTG!! I used a better brand of muscovado sugar in lieu of white sugar and I added some figs…Ooooooo and it is in the color I want.This is a fruitful day for me!! Thanks! Just a quick note from the management to say, we are so glad you like our hotel but also to assure anyone considering a ‘stay’ that we DO have many rooms with an enclosed bathroom (i.e. with privacy). Although they do have a huge sliding glass panel if you are feeling brave. 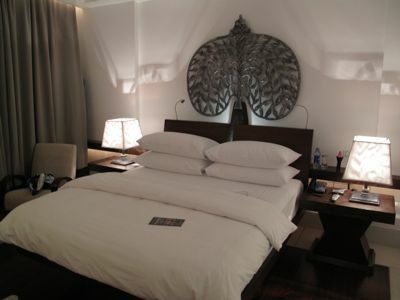 We also have some suite rooms with the oversize bath literally in the centre of the room. 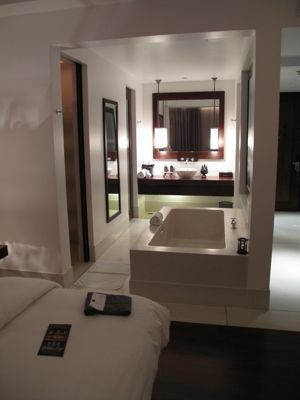 When correctly positioned on the bed, you can watch TV and someone in the bath simultaneously! I guess it’s all good clean fun! Great post, MM! How did you find this hotel? Do you act as your own travel agent, meaning you book flights, hotels, etc on your own or do you utilize travel agents? Ok…how about this, Marisse…you soak the rice (that way, without a doubt, it is ordinary rice you will be using), then go to the palengke and have it ground. You can do that, right? or better yet, how about, MM…maybe you can send Marisse recular rice flour?!?. I can just imagine your pantry looking like Costco! Then, what time would you like me to call you, Marisse? ..once you have sent me your phone no, though! Pati ako, hindi makatulog sa Putong Ube mo! tnm, we have a very good travel agent, but Mrs. MM booked this hotel herself. Too rich for my blood especially in this economy. Now i wanna go Siam Reap !! Can you suggest how to fly to SR fm Manila. Intrusive Marketing Tactics – A major rant!! !